I am just stunned right now. I know Dr. William P. Foster is turning over in his grave right now. As a graduate of FAMU, I can say that the hazing that goes on in the band is notorious. I just hate that it may have resulted in the death of a young man with his whole life in front of him. My heart goes out to the Champion family as well as the entire FAMU family. Florida A&M President Dr. James Ammons announced today that the university has suspended band performances indefinitely following the death of drum major Robert Champion. Dr. Ammons also announced the school would form an independent task force to investigate Champion’s death, along with any “unauthorized activities” association with the school’s band, The Marching 100, reports Atlanta’s NBC affiliate 11 Alive. The school’s “band, staff, students and history” will all be subject to investigation, Dr. Ammons said in a press conference Tuesday afternoon. Since Champion’s death Saturday, blogs and social media sites have been flooded with posts speculating that Champion’s death may be connected with hazing. Dr. Ammons addressed those claims, asking people to stop engaging in rumors, but also acknowledging that several band members have been released from the band this semester because of possible participation in hazing. “Hazing is illegal and it’s something that should not happen,” he said. “I am committed to making certain that we end this practice” at the university. Champion, 27, died suddenly following the Florida Classic Saturday. 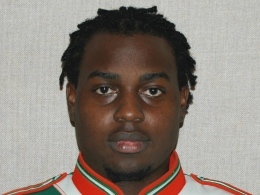 The Atlanta native had just returned to the FAMU marching band’s hotel, in Orlando, FL, when he became sick and complained of being unable to breathe. Friends of the victim called 911. He was transported to Doctor Phillips Hospital where he was pronounced dead. Authorities do not suspect foul-play. Champion, a 2004 graduate of Southwest Dekalb High School, was a member of the famed FAMU Marching 100. 11Alive News contacted a relative who said the family is in a state of shock and unable to speak about the death. He went on to say they know very little at this time. The university is preparing to provide grief counseling for band members and students. An autopsy was performed Monday and results are pending.